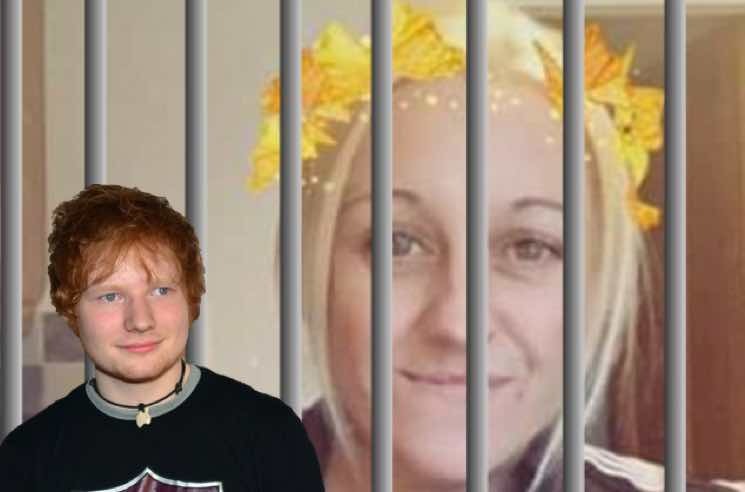 A woman in the UK has been sentenced to eight weeks in prison after playing an Ed Sheeran song on repeat at high volume for half an hour. The neighbour of Sonia Bryce, a mother of three who resides in the town of Willenhall, told the Daily Mail that the repetitive aural onslaught of "Shape of You" was "the straw that broke the camel's back" following months of other disturbances. Prior to the Sheeran-related incident, Bryce allegedly hosted loud parties and there were repeated disturbances from her home involving "music, shouting, swearing and banging," as detailed by CCTV footage and a log kept by her neighbour, Clare Tidmarsh. Following months of stress, though, it was Sheeran's "Shape of You" on blast for 30 minutes straight that put the final nail in the coffin, spurring Tidmarsh to take her complaint to court. Bryce denied playing the song, claiming that she "doesn't even like" the singer's work, but the judge ruled that there was enough "ungovernable animosity" to warrant an eight-week jail sentence. Bryce had previously been jailed for breaching a court order brought about by her landlords, which explicitly banned her from creating nuisance or annoyance. "Everybody is entitled to live in a degree of peace and quiet with the usual give and take of society," the judge ruled. "But you do not behave like a civilized person, and you have got to learn that you will." You can hear the offending song below — but for society's sake, please use headphones.